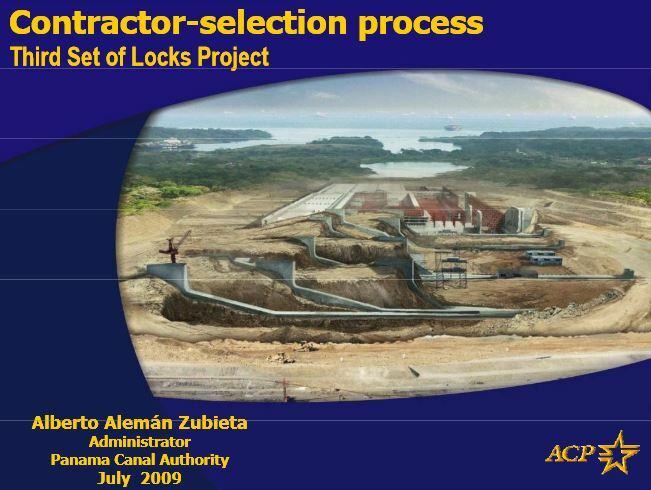 What neither the ACP nor Panama’s rabiblanco media want to mention is that Alberto Alemán Zubieta’s family owns one of the companies in the GUPC consortium that was awarded the locks design and construction contract by way of a lowball bid. 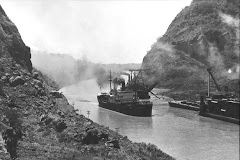 Alemán Zubieta was CEO of that company, Constructora Urbana SA (CUSA) just before he became canal administator. Graphic by the ACP. Bechtel reps state a consortium cannot even “pour the concrete” for $3.1 billion and hinted even their $4.2 billion price was closer to a lowball bid than a value bid. It is widely expected that during construction, Sacyr will attempt to renegotiate the price with the ACP. They come in with drills to bore holes of a diameter where they can put the steal and a sealant. They’re going to put in vertical bars. In the first design, for reinforcement of one of the Atlantic jambs, they will put in some 60 bars in an area identified as where they should be placed. In addition, diagonal bars will be placed on the same side of the jamb. 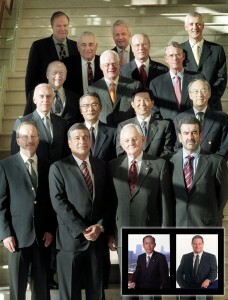 The Panama Canal Authority administration, board of directors and advisory board are notorious men’s clubs, with a few exceptions. So, what to do when on a Friday some bad news and dubious suggested remedies come in from the troubled GUPC consortium? Canal Administrator Jorge Luis Quijano didn’t have anything to say about it — the following Monday he was busy receiving an award from the Real Estate Brokers Association (ACOBIR) for excellence in running a public infrastructure project. Minister of Canal Affairs Roberto Roy also held his tongue — the following Tuesday he took off for Washington to speak to the American Chamber of Commerce. They left it to the sole female near the top of the canal administration, Ilya Espino de Marotta, to break the news softly through the most sympathetic to the ACP of all Panamanian media (because of lots of business, family and political ties between their respective managements), La Prensa. The news does look bad, and it may be a lot worse than GUPC and the ACP let on. GUPC calls it a design problem with both sets of locks, a problem with not enough rebar. 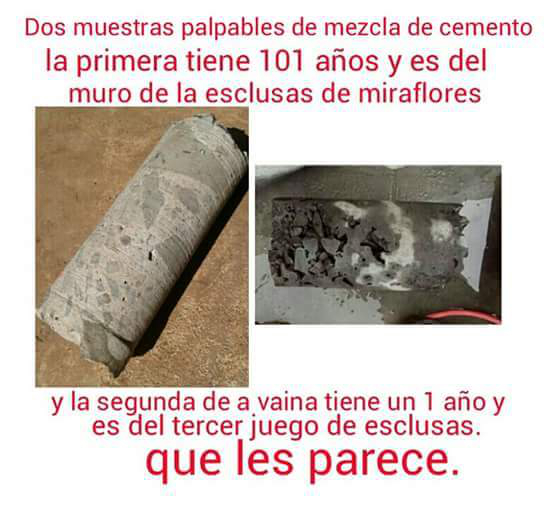 Widely published photos of core samples suggest defective, improperly poured concrete. So will a retrofit with some 18-guage rebar and some sealant make for a construction job that will last the specified 100 years? Or will it not? And if it won’t, will the current ACP management just accept it anyway in order to avoid being too far behind deadline, and leave it for a future set of execs when things start to crumble? Or if it won’t, will the ACP insist that the defective work be torn out and redone? The canal expansion was originally scheduled to be done in August of 2014, and after several delays the open for traffic date has been moved back to April of 2016, but if parts or all of both new sets of locks have to be torn out and redone it will mean another major delay and probably bankrupt one or more of the companies in the GUPC consortium.